Lesley Batchelor OBE is an expert on world trade and a passionate champion of UK exporters. She is also the Director General of the Institute of Export, the professional membership body representing and supporting the interests of everyone involved in importing, exporting and international trade. To move goods around the world it helps to understand what agreements countries have made regarding trade – sometimes called bi-lateral agreements – and the many types of trading blocs – groups of countries that trade together. If we use the most obvious trading bloc of the European Union, you can see that your goods can move around are unrestricted, unless they have to go through Export Controls (goods which have a possible military dual use for example). The paperwork is therefore minimal, with the main concern being who pays the VAT or the local equivalent in each market – you can read our guide to VAT for exports for more information. Goods need to be identified so we use a Harmonised Code that identifies the goods in terms of the materials used in manufacture, which dictates the eventual country of origin – we have an article for finding the appropriate code for your products. Services are not subjected to this process but are still accountable in terms of local taxes and evidence of delivery. The Harmonised Code will also decide if your cargo needs special treatment and is a vital element in making decisions on which market to chose if research shows that one carries a particularly heavy tax regime. World trade also relies on the law, and the implementation of it, starting with overriding conventions that deal with the manner in which transport, for example, is managed, through to directives from our EU partners on competition and agency, to Acts of Parliament that regulate our English law, and finally tort law, which is the basis for common law. These laws all impact on contracts, insurance and Intellectual Property across the world – you can read more about protecting IP abroad. 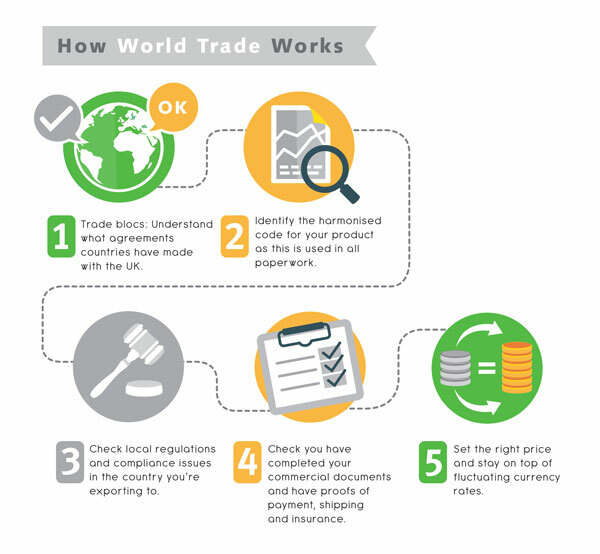 Finally, world trade works on understanding the manner in which currency is traded and the importance of getting paid. Trading internationally has to be profitable otherwise it is pointless, so find out how to get paid and how to convert your foreign currency in a timely way to make a profit. Remember that you can read more about getting paid. So use the resources on Open to Export to develop an action plan, and enjoy global trade!